What are superfoods – Just what are they and, more importantly, do they live up to their name? There are so many foods that are good for us, but eating just one or two of them is not going to keep us healthy or happy. Even if they are ‘superfoods’ or you are superhuman. Anyone who has tried to study nutrition will know how complicated it can be. Which is why the idea of a superfood might be so appealing. No longer do we need a varied and balanced diet. Instead we can make Kale and pomegranate smoothies and eat all the chips and cheese we want, hoorah! We thought sliced bread was nifty but this superfood discovery really is the moon landing of modern invention. However, most of the nutrients found in these superfoods can also be obtained by eating other non-superfoods. And even if they are ‘rich’ in particular vitamins and minerals, don’t forget that too much of some vitamins and minerals is not good for you. Spinach contains more iron, magnesium and potassium than kale don’t you know. We also know that some nutrients in certain foods will stop the nutrients in other foods from being absorbed. Tea, eggs and calcium rich foods may all inhibit the absorption of iron in the body. This is why it is really important we eat a varied and balanced diet, so that our bodies can absorb all the nutrients they need. This without us having to map and stick to a very complicated diet plan which would probably not include that trifle we took a shine to while shopping for our superfoods. We can take a simple example like Calcium. Our main sources of calcium are dairy products but you can also get calcium from green leafy vegetables, tofu and other sources. 99% of calcium is stored in our bones and teeth. Long term, a lack of calcium can cause osteoporosis and bone fractures. Too much salt can cause too much calcium to be excreted. Too much sugar can stop calcium from being absorbed and depletes phosphorus which is also important in helping calcium get absorbed. Too much calcium also has its side effects. In one study they suggested that it may increase the likelihood of heart disease and other ailments. A kale only diet, a protein only diet, any diet which excludes an entire food group should be viewed with caution. Everyone is different, which makes a one-diet-fits-all solution even less plausible. Some of us can eat lots of white bread and rice and hardly any fibre and go jogging and out for dinner and clean the entire house and be fine. Whereas others need regular fibre plus fruit and vegetables and maybe a brisk walk every day to achieve the same. So, yes, superfoods are good for us but so are lots of other foods that are not classed as superfoods. Like me, I’m sure lots of you will be annoyed that your favourite food isn’t yet classed as a superfood. How can Broccoli not be a superfood?! And Chocolate? And pies and stews and Lasagne on a cold wintery day – where are the ‘supermeals’? What are superfoods without supermeals, and supercooks and superwashers up? If nothing else, until these foods are categorised properly I think we should keep eating a varied and balanced diet, which includes ‘superfoods’. 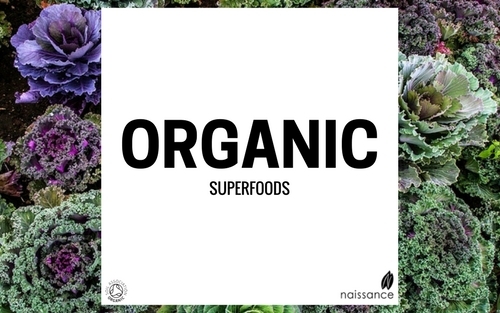 So, has this convinced you about the health benefits of organic superfoods, and will you start looking for them in your local food store? Please do let us know.